Not a classic championship layout, however it boasts many fantastic golf holes on a beautiful naturally designed course. The 27 hole course provides a layout of 7,123 yards and a par 72. Built in 1993 it’s a mature and gorgeous course located in the mountains and beset by a maze of streams, providing both course maintenance and fantastic natural hazards. Having a range of hole difficulties some appear quite bland while others are more sophisticated and technically demanding. The clubhouse is well equipped providing a fantastic range of amenities that any golfer would happy to enjoy including: rental equipment, locker rooms, pro shop, café, two putting greens, chipping area and driving range. Majestic Creek Country Club is a preference among expatriates and locals residing in the area as the course conditions are the most dependable all year round as compared to all other Hua Hin golf courses. 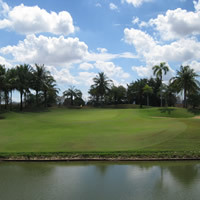 The stunning scenery makes it definitely worth visiting to play a game or two while you are in Hua Hin.